Description: It is a front-end for various translation websites (including Google Translate, Microsoft Translator, Babylon, Prompt, SDL and Yandex) and dictionary services (including Google Search, Wikipedia, Babylon Dictionary, WordReference, ImTranslator and Multitran). 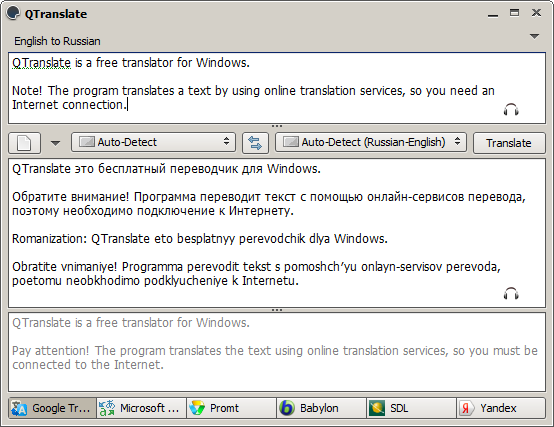 Open the main window to enter or paste text (up to 100 characters), or simply select text and press a hotkey for a popup translation window. The program also has the ability to speak text and do a web search.